Ethics concerns how one ought to live one’s life. The aim of an ethics of ecology is to help us avoid disturbing the ecological integrity, stability and beauty of nature. 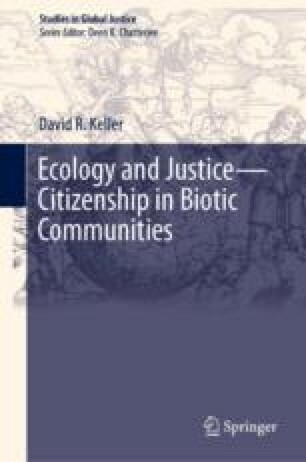 This is in turn a necessary condition for bringing about ecological justice, understood as comprised of justice to both human and nonhuman organisms and systems. Because humans are moral agents embedded in biotic communities, our actions inescapably impact other beings worthy of moral consideration. A moral agent is free, in the sense of having a range of possible choices about how to treat other beings worthy of moral consideration. Reason demands that we strive to make our moral judgments comprehensive, consistent, coherent, and verifiable. Yet there remains the question of what makes a being or ecosystem worthy of moral consideration: what gives it value such that we should value it? Here we face the “is/ought gap” between descriptions and prescriptions, which rests on the ontological distinction between mind and matter. Bridging the gap first requires abandoning the metaphysics of mind-matter dualism and the mechanical view of nature. Second, it requires bioempathy. Bioempathy is a natural response to recognition of the beauty of organisms and ecosystems. Thus, aesthetics takes us from cognizance of facts to appreciation of natural value. Keller, David R. 1998. Ecological Hermeneutics. Proceedings of the Twentieth World Congress of Philosophy, Boston, MA, August 12. http://www.bu.edu/wcp/Papers/Envi/EnviKell.htm. Accessed 21 August 2011.